Today we took possession of a critical tool, a necessary implement, and a dream-come-true for my husband: a NEW TRACTOR!!! This is the second expensive purchase we made late last year (the other being the wood cookstove). I'll leave you to speculate how difficult it is to get heavy work done around a homestead without a force multiplier. In the absence of trained horses, a tractor is the next best thing. ...then died. We hauled it in for repair. When we got it back, it worked for, oh, half an hour and died again. We hauled it in for repair again. Same story -- it worked beautifully for a short time, then died. Hauled it in again. Repeat. Repeat. Repeat. 8N tractors are fairly simple beasts, mechanically-speaking, but our mechanic couldn't keep this baby dependable no matter how much time it spent in his shop. It has been inoperable for about the last six years. Don is a jack of many trades, but mechanics isn't one of them. The continuous trouble the old tractor gave him was endlessly frustrating. In the absence of a working workhorse, we borrowed a tractor from obliging friends and neighbors whenever we needed one. But we needed the use of a tractor far more frequently than we felt we could borrow... after all, we could only trespass so far on their good graces. This meant many of our improvement projects were put off and we only used the borrowed tractor for immediate and pressing needs. In other words, we needed a tractor of our own. But my goodness, tractors are expensive. For twelve years -- since moving to Idaho -- we were unable to afford one. 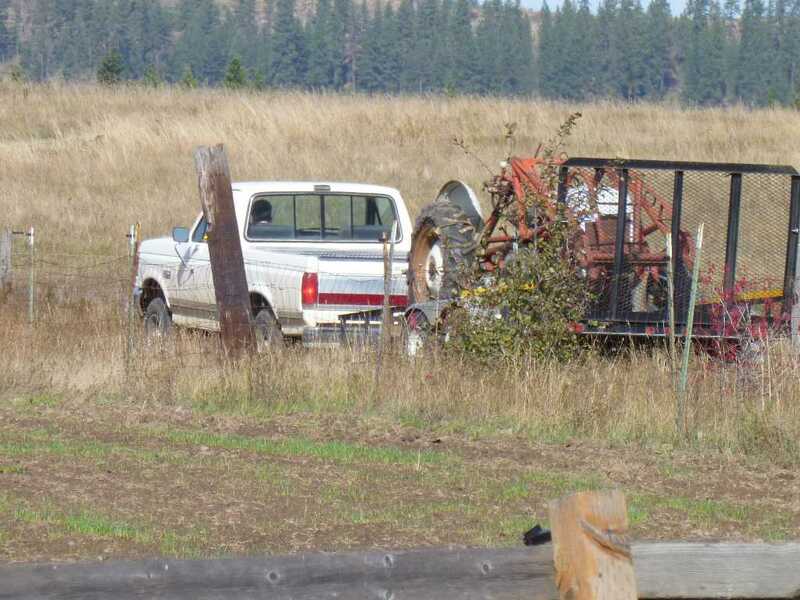 We've flirted with the idea of buying a used tractor, but in light of Don's (self-described) lack of mechanical aptitude, he was leery of buying a machine that might repeat the same problems as our Ford 8N -- more time in the shop than in the field. All these issues seemed insurmountable until two things happened. One, last fall we sold our booth at the Kansas City Renaissance Festival after 18 years. It was a hard decision to give up the booth, but the workload around KC was so intense that it was burning us out. We didn't receive a huge amount for its sale, but it was a lump sum we were unlikely to ever see in one fell swoop again. So we earmarked this money for the purchase of a tractor. And two, Don found NEW tractors offered for a far more affordable price than he anticipated, through Northern Tool & Equipment. These are Chinese-made (though American assembled) machines. He was wary of purchasing a Chinese-made tractor until he did some intense research on reviews... and came away impressed. It appeared these beasts of burden have an excellent track record. So we made the decision to take out a small loan to finance the difference in purchasing price... and bought a tractor. We placed the order in mid-December and waited patiently while it was assembled. Well, *I* was patient. Don was a bundle of nerves. He's wanted a tractor so badly for twelve years that he was like a little kid on Christmas Eve, waiting for it to arrive. At long long last we got the call that it was on its way (shipping from Minnesota). Don stayed in contact with the driver and gave him directions. Since the tractor was coming in on what we thought was a flatbed 18-wheeler, we agreed to meet him on the paved road a couple miles from our house. Here's the trucker, arriving on the highway. To our surprise, the driver had a fifth-wheel flatbed on a dually truck (rather than an 18-wheeler). 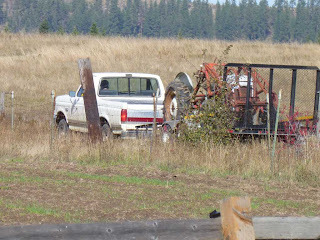 So Don arranged with the driver to put his rig in four-wheel drive and followed us home, rather than off-load the tractor on the paved road. Here he is, pulling into our driveway. Once the tractor was free, Don climbed into the driver's seat and tried to figure out how to start it (he had the instruction manual). This is a working man's tractor, not a hobby tractor, which meant it was more complicated to operate. At first the engine didn't want to turn over (giving us some heart-stopping moments) but it turns out the engine was just cold after traveling in a northern route between Minnesota and north Idaho (particularly North Dakota, the driver told us, where the temp dropped to -27F). But eventually it turned over, began purring beautifully, and Don drove it carefully down the ramp. A neighbor came over to admire, and he and Don spent half an hour in typical masculine camaraderie of admiring a beautiful piece of machinery. The neighbor came away "jealous." LOL -- tractor envy, the scourge of rural men everywhere. ...and lovingly parked it in the barn, where we had a spot reserved for it. We're on a strictly frugal new year as we work to pay off the loan, but let me tell you... I have a very Happy Husband tonight! Meanwhile, we have an old Ford 8N tractor for sale, if anyone's interested. Congratulations on the new tractor! Oh my goodness! This is a big deal! Yes, I think a period of frugality will most certainly worth it for a tractor like that one. And something tells me it and its owner will soon be very popular and in demand, perhaps lessening the degree of need for frugality. Congratulations on two very practical gifts for yourselves. My first cooking lesson was on my great grandma's coal stove (she lived in Virginia). If I were to ever be able to build a "dream" home, it surely would include a wood cook stove. As for the tractor, that is one of those items that will make your homestead a happier place. Oh, and that driver, I know how he feels about the cold weather in North Dakota. I visited my daughter, son-in-law, and grandchildren over Christmas. They live in a tiny town in ND, boy was it cold. What gets me is most homes in her area are not equipped with any type of alternate heat sources (fireplaces, wood stoves, etc.). I thought that if a storm happened, and she lost power, there are not enough blankets on the planet to fix that kind of cold. it was below zero for most of our trip. I was glad to get to Colorado where my son lives, and it was much warmer, single digits. Well, enjoy your new tangible toys. Congratulations!! I'd better not send this link to my husband or he will have a bad case of tractor envy, too!! Enjoy! Oh, my! Congratulations! Details, please! Gas or diesel? How much horsepower? Can you order attachments? Diesel, 36 hp, and yes (that's quoting my husband). We may be able to adapt a couple of attachments (notably our auger) from the old tractor. Sorry, typo -- that was supposed to be 35 hp, not 36. My comment got eaten, so pardon if this is a duplicate. How much horsepower? Gas or diesel? Can you order attachments? Congrats Happy Husband!!!! It's a beaut!!! When my wife and I retired, and the old house sold, The first 2 things I did was pay off the new home and buy a tractor. That was 6 years ago and although I have only a few hundred hours on it I could not live without it. I do start it up and let it run for 30 min. at least every 2 weeks through the winter. That lets it get warmed up and everything internal coated in oil. It also charges up the battery. Congratulations!!! You will have a good machine for many years to come. We bought our tractors new in the early 1970's, scrimped to pay off the loans, and today we still have serviceable machines (although a little out of date, if a tractor can be out of date!) Congrats to you both! When we moved to our farm, my hubby insisted that we couldn't make it without a Bobcat (w/bucket and forks.) I resisted. The expense! How would we ever afford it? You don't have to be a man to have tractor envy. That red beast is gorgeous. BTW: For my book this week, I chose the anthology/short story compilation, Just So Stories by Kipling. ("How the Leopard Got His Spots." "How the Camel Got His Hump." etc.) Just my speed! So funny. speaking from experience, obtaining a good tractor can be a life altering experience. This is a great addition to the homestead. And it will make life easier all around the place, especially chores! As we grow older, or is that more "mature", we just we need more help. And this purchase will do that. And I can see from Don's body language he hasn't been this excited since the "Honeymoon" LOL.. Enjoy! Great photos. Makes me want a new tractor. Of course I don't need a tractor, new or otherwise. Still makes me want one. How fun! My hubby would be jealous too! Congratulations!! You will wonder how you ever did without that red beauty:) But, I want to know how the cook stove project is coming along? Just make sure you can use any brand of implements, and that it has a 3 point hook p at the PTO. Implements are much easier to borrow than tractors. I would be very leery of Chinese made parts, the Chinese are not known for their quality. Another thing to consider is there someone close by that can service it if it breaks down, do they have experience with this type of tractor? Personally I would have kept the money and instead of taking out a loan, saved the money and then bought the tractor outright. Might as well pay yourself the interest instead of the bankers. I'm glad you have a new tractor and I hope it works well for you. Congratulations! Jackie & Will, you and us! My in-laws bought a used 8-n Ford in the 1960's and they still use it. One thing about the 8-Ns - you can still get parts. It has been overhauled a couple of times. Your tractor rolled past 5 miles north of me on its cold journey. I am sure Don will, but do remind him that the grease gun, the correct diesel blend for the conditions (cold weather additive if necessary) and quality hydraulic fluid (also temperature appropriate) as per the owners manual are his best friends. We were just forced to replace a larger tractor due to lack of maintenance and abuse by the previous owner. We did get a very good buy on it when we bought it (12 years ago), but had to do a LOT of welding on it before we could use it and many times since then It has required work to keep going but a very talented mechanic/technician (DH) has kept it going - until the cast frame started cracking. Oil, fuel and other filters can be expensive, but will add years to the life of your tractor. The manual work it saves you will have you wondering how you got along without it. Front wheel assist too......he (and you) will love it. I've been following your blog so long that I feel as happy as you do... It's awesome! Thank you for your update. I will continue to drive my old John Deere and support the USA rather than buy Chinese. I do not understand your priorities but do hope the new tractor does work out for you. Congrats on the new tractor! I own the same size only in Kubota. 1.Make or buy a counterweight for the 3 point hitch on the back, this will allow you to do much more with the tractor. You need about 500 lbs to do it right. 2. If you don't have fluid in the tires (more weight) then have that added as well. You won't be sorry that you did. The added traction and lifting capacity is worth the money. 3. Have someone weld a hook to the top of the bucket so you can hook a chain up. Worth the money as it makes lifting things safer and easier. Won't cost much. 4. Slip on forks (as in forklift) are your friend for lifting stuff. Just don't overload them or you will bend the bucket. Northern Tool sells these as well. 5. If you are going to be working at night, add some lights on the rollbar/ROPS. You'll be glad you did. I cannot agree more with your commenter that said that preventative maintainance is the best way to extend the life of your tractor.....and fuel treatments in the winter are a *MUST*....and the Grease Gun is your friend. Grease is cheap. The tractor *was* made in China, the implements and attachments are made in the US, all assembled in the US by US workers...You would be very surprised at how few parts for your similar sized John Deere are made in the US. Less than 20% of any sub 75 HP John Deere are made here. Most are Chinese or Korean and the tractors are partially assembled there as well. "remove the speck from thine own eye first"
Again, Congrats on your new purchase. I would ask you to cite your references indicating less than 20% of my 1971 John Deere tractor was made in the USA. Yup, I would like to see that. Hey, you slammed her for buying a Chinese tractor.... I pointed out that even buying a John Deere wouldn't have made much if any difference. Wanna argue? Email me. I'm not gonna do it on Patrice's blog. Well, I am still waiting for your sources about my tractor. How is your research coming? In the meantime, please know that I did not "deride" nor "slam" anyone in my comments. Goodness, if anyone deserves a new tractor, then is it this family. And I am sincerely pleased for them and hope it works out well for them. Consider the larger picture for a moment. I worry about what we do as Americans. What I am interested in calling attention to is the practice of espousing self reliance, independence and frugality one minute and then turning around and buying on credit a major purchase from a communist country that is arguably of poorer quality all just because it is less expensive. I don't get that. Yes, I drive old tractors and do my own repairs and wonder since when has fixing things yourself and making things work on your own gone out of style? I do not think you have to always buy something new to stimulate the economy. I am not interested in Pocketbook Patriotism. Reread what I wrote. If you cannot comprehend what I wrote the EMAIL me for an explanation. This has gone on far enough. You suggested that the purchase of a chinese tractor was not a good idea. "John Deere and support the USA rather than buy Chinese. I do not understand your priorities but do hope the new tractor does work out for you." I pointed out that it mattered little WHERE they got it, as they were all foreign made today, even your precious John Deere brand . And yes, "Pocketbook Patriotism" matters. Our country needs the work and the income. Your old tractor doesn't matter to the country as a whole anymore..
No more replies to you. Email me if you wanna take it further or drop it here. My 100 hp John Deere is extremely handy as well as a good farming tractor. And it was made in Germany! Just because it's green doesn't mean it was made here anymore. Thanks for the 8N offer. We already have one. Congrates on the new tractor, It gives one another reason to look forward to spring. You never shared what kind of problems you were having with your 8N or what you had fixed. I also have an old 8N and was having a problem that sounded a lot like your. My problem was with the electrical system. Replaced the points, plugs, wires, etc, nothing would help to get the old tractor to run consistently. I finally took the distributor off (a front mount) and took it it the office where I have a coworker who is an old John Deere wrench. In his office we removed the cap, router, point and finally removed the metal spring that hold the bottom of the distributor in place ( I also an not very mechanical so I do not know all the technical/mechanical part names), Below this plate was a cam that rids on the shaft of the distributor that has a set of weights on it that fly out as the tractor increases in RPMs that slows down the distributor to keep the timing set correctly. This part that worn over time (65 year) and was not flying in and out correctly so the timing was off. I replace this part for about $35 dollars on ebay and the tractor fired right up and has been running fine ever since. Again, not sure what your problem was but this was a cheap and easy thing to look at and fix. Hope you can get this old tractor to work even with the new one around. Well, I've got to tell you, thanks to your post and comments from readers, that we acquired a NEW LOG SPLITTER as our Christmas present this year. Thanks for all your help, knowledge and smart commenters! Talk about a Happy Husband, mine has a very Happy Wife! Not to mention, lots of split wood! Thanks again. p.s. Congratulations on the new tractor! Hi, I know this was nearly 1 and 1/2 years ago but was your tractor from Northern tool a Nortrac 50XT 50 hp model? If so, How has it been for you guys? TY, Joe. Hi Patrice, Moved my family to a farm in N. Idaho last year, running a '52 Ford 8N but looking at getting a modern tractor w/loader and backhoe as an upgrade. How has the Nortrac been performing over the last few years?